A person commits Robbery when he or she unlawfully takes personal property from the person of another or in his or her presence against his or her will by the use or threatened use of immediate force, violence, or fear of injury to that person or his or her property or the person or property of anyone. Robbery is one of the most seriously prosecuted crimes in Washington because it is both a crime of violence and a theft. Robbery crimes threaten public safety. They are also “strike offenses” under Washington’s 3-strikes laws. For these reasons, it is critically important to find experienced and effective counsel to seek dismissals and reductions of these very serious charges. A person is guilty of Robbery in the First Degree if, in the commission of a robbery or of immediate flight therefrom, he or she:(1) is armed with a deadly weapon; or (2) displays what appears to be a firearm or other deadly weapon; or (3) Inflicts bodily injury; or (4) commits a robbery within and against a financial institution. Robbery in the first degree is a Class A Felony punishable up to 25 years in prison and a $50,000.00 fine. 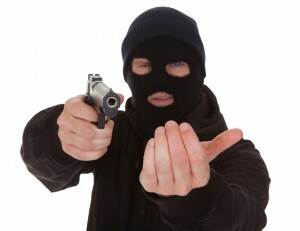 To convict a person of the crime of robbery in the second degree, the prosecution must prove beyond a reasonable doubt each of the following elements: (1) that the defendant unlawfully took personal property from the person or in the presence of another; (2) that the defendant intended to commit theft of the property; (3) that the taking was against that person’s will by the defendant’s use or threatened use of immediate force, violence, or fear of injury to that person, to that person’s property, or to the person or property of another; and (4) that force or fear was used by the defendant to obtain or retain possession of the property, to prevent or overcome resistance to the taking, or to prevent knowledge of the taking. If you or someone you care about faces Robbery charges in Skagit County or Whatcom County, call attorney Alexander Ransom today for a free, no-pressure case evaluation. Alexander has a reputation in the legal community as an aggressive, effective and experienced criminal defense attorney. He is here to assist you through these difficult times.